An "emotionally aware" computer system designed to read people's minds by analysing expressions will be featured at a major London exhibition. Visitors to the Royal Society Summer Science Exhibition are being invited to help "train" the computer how to read joy, anger and other expressions. Its designers say there are potential commercial uses, such as picking the right time to sell someone something. But it may also help improve driver safety and help people with autism. 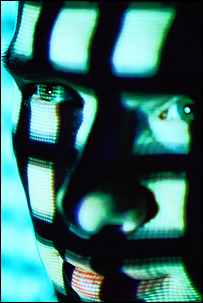 The computer, which is connected to a camera, locates and tracks 24 facial "feature points" such as the edge of the nose, the eyebrows and the corners of the mouth. A total of 20 key facial movements - including a nod or shake of the head, a raise of the eyebrow or a pull on the corner of the mouth - have been identified. Combinations of these movements, which are thought to represent underlying emotions, are then fed into software and used to detect the same facial combinations in real-life situations. Peter Robinson, professor of computer technology at the University of Cambridge, said: "The system can already cope with the variation in people's facial composition; for example, if you have a round or thin face, or if you wear glasses or have a beard. "However, there are small variations in the way people express the same emotion." The scientists have been "training" the recognition system by using actors to make different facial expressions. They hope the exhibition will generate valuable new data to improve the programme's ability to read faces. Professor Robinson added: "Our research could enable websites to tailor advertising or products to your mood." For example, he explained, software linked to a webcam could process a person's image, encode the correct emotional state and transmit the information to a website, which could then display products or advertising. The technology is also being developed for use in cars to improve driver safety. The team is recording the faces of volunteers in driving situations and monitoring facial movements to identify more complex expressions linked to confusion, boredom or tiredness. "We are working with a big car company and they envision this being employed in cars within five years," Professor Robinson said, adding that a camera could be built into the dashboard. The team is also working with colleagues at the Massachusetts Institute of Technology to develop a wearable version of the system, to help those with conditions, such as autism and Asperger's syndrome, who have particular difficulty in reading other people's facial expressions and emotions. The headset, which is at its first prototype stage, would interpret other people's moods and communicate those to the wearer. The Royal Society Summer Science Exhibition runs from Monday 3 July to Thursday 6 July at The Royal Society, 6-9 Carlton House Terrace, London SW1Y 5AG.